Few cult classics have had such a strong and everlasting cultural impact than “The Rocky Horror Picture Show, ” and it always gains a new set of fans from one generation to the next. 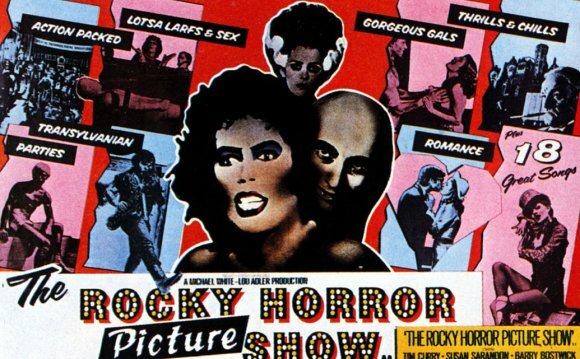 Based on the musical "The Rocky Horror Show" written by Richard O'Brien, it was a critical and commercial disappointment upon its release in 1975, but it went on to become a motion picture that made talking during the movie seem like not such a bad thing. Once it was introduced into the realm of midnight screenings in theaters everywhere, its influence became widespread and achieved a popularity many movies only dream of attaining. Recently, the movie celebrated its 40th anniversary outside of the building formerly known as the Mann Festival Theater in Westwood, California where it made its Los Angeles debut. Of all the cinemas it premiered in, it did the best business there when it was originally released. The theater closed down a number of years ago, but that fact wasn’t about to stop anyone from making the world remember that this is where “The Rocky Horror Picture Show” got its start. In attendance for this celebration which was held on a ridiculously hot October day were Tim Curry who originated the role of Dr. Frank N. Furter, Lou Adler who produced the movie, Sal Piro who is the longtime President of the “Rocky Horror Picture Show” fan club and Los Angeles City Councilmember Paul Koretz. Joining them were a number of die-hard fans who did not hesitate to dress up as their favorite characters and the cast of Sins O’ The Flesh, a group of actors who perform at Saturday screenings of “Rocky Horror Picture Show” at the Nuart Theater in Santa Monica. Adler remarked that there were almost as many people at this celebration as there were at the movie’s opening back in 1975, and he thanked what he called the “true fans” for showing up here as well as at every screening of this movie from one year to the next. Adler also remarked how this movie should have won Curry the Academy Award for Best Actor back in 1975, and those in attendance were very much in agreement. Piro was honored to be part of this celebration and remarked at how and others put out the word about the “Rocky Horror” midnight screenings in a time before there was social media or the internet. The fans came to see this movie over and over again through pure word of mouth, and it was the same group of people who came which showed how much it meant to them. I myself got the fortunate opportunity to talk with Curry following the ceremony. In addition to “The Rocky Horror Picture Show, ” he also appeared in another cult classic movie called “Clue.” I asked him what the secret was to making a cult classic like this, and he replied that if he knew he would have done another one. Be sure to check out the video of the anniversary celebration above. “The Rocky Horror Picture Show” recently made its Blu-ray debut in honor of its 40th anniversary, but nothing will compare to seeing it on the big screen along with its many devoted followers.